In mid-February I escaped the miserably cold weather in Southern Ohio and flew to the relative balminess of Germany and Denmark to visit Avantgarde Acoustics in Bensheim outside of Frankfurt, and Raidho Acoustics in Pandrup on the northwest coast of Denmark (with a little stop in Paris—for which, see above). The object of my trip was to hear four new loudspeakers, two “affordable” models and two cost-no-object ones from both companies. In Germany, I listened to the $17k Avantgarde Zero 1 (the world’s first active, digitally-corrected-and-crossed-over, plug-and-play horn loudspeaker, which I will soon review in TAS) and the $120k Avantgarde Trios with Basshorns (the company’s fabulous flagship system, which I will also review in TAS in the future). In Denmark I auditioned Raidho’s new $7k stand-mounted X-1 two-way (which was introduced so successfully at this year’s CES) and its new flagship, the $210k, quasi-ribbon/diamond-driver, multiway floorstander, the D-5, which I will review in TAS in several months. (I also listened to many of the other speakers in the Raidho line and several new products from a new company founded by Raidho’s Michael Borresen and Lars Christensen, Ansuz Acoustics). Although I’d never visited Avantgarde before, I am certainly familiar with its products. Indeed, the first review I wrote for Fi magazine was a lengthy rave of Avantgarde’s then-brand-new Trio Compacts. Hearing the latest, vastly improved versions of these excellent loudspeakers some two decades later was a fascinating experience. Indeed, the difference between the Trio system then and now will be the subject of my future article in TAS. I’d visited Raidho once before—about a year and half ago—to hear what later became my reference loudspeaker, the $140k C-4.1 ribbon/ceramic-cone multiway floorstander, which, until very recently, was also Raidho’s flagship transducer. But, as you will soon see, Raidho has something new in store—the $210k D-5 floorstander with a ribbon/diamond-cone array—that will be formally introduced at Munich High End in May. It was Raidho’s new all-out-effort that I came to hear—and, brother, was it worth the trip! 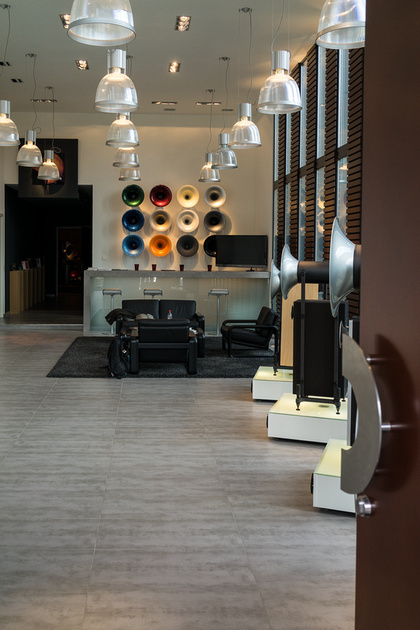 What you’re looking at is the view through the door of Avantgarde's gorgeous showroom in Bensheim, Lautertal-Reichenbach, Germany. Over the years I’ve visited many manufacturers here and abroad, but (as you can see for yourself on my Zenfolio site) I’ve never visited an audio company with the consistent high visual style of Avantgarde Acoustics, whose every view (from this one at the very doorstep of its showroom through its listening room and its offices) is like a page out of Architectural Digest. One of the speakers that I came to see—and the first one I will review in TAS—is the Zero 1, shown above. The Zero 1 is actually something new under the hi-fi sun. While powered, digitally-corrected dynamic loudspeakers have been around since Meridian pioneered them several decades ago, I have never before seen a horn loudspeaker thus constituted. The Zero 1 is that very thing. Though not inexpensive at $17,000 ($18,000 with the optional analog-to-digital interface board), the Zero 1 is veritably bursting with advanced technologies. First of all, it is internally powered by a Class D amplifier (for the bass) and two analog amplifiers (for the mid and treble)—all tailored and dedicated to each of the three drivers. These aren’t off-the shelf amplifiers; the Class D amp, for example, uses some (not all) of the same technology developed by Avantgarde’s resident technical guru, Matthias Ruff, for Avantgarde’s own line of electronics, the XA Series amp and preamp. Next, its three drivers are digitally crossed-over using complex slopes that would be nearly impossible to implement via analog means, and digitally corrected for distortion and for perfect phase, time, and frequency linearity within a listening “bubble” of 2-to-4m (with 3m being ideal). Once again, the digital crossovers and the correction circuitry in the Zero 1 aren’t based on the chips found in home-theater receivers. 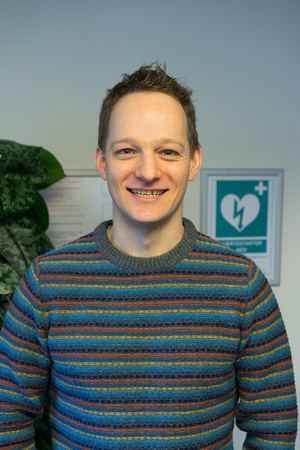 All of the digital processing is implemented via 66-bit FPGA using technology comissioned from Denmark’s resident digital genius Thomas Holm, whose digital correction products are so highly regarded by TAS’ Robert E. Greene. Also new and unique is the Zero 1’s cabinet, which is made of an ABS polymer-sandwich material with extraordinarily good self-damping properties (thanks to its randomly-distributed, randomly-sized bubble-like internal structure). With spherical horns molded into its spare facade, it has the same Bauhaus, form-follows-function good looks as Avantgarde’s other strikingly stylish products. With AirPort Express wireless capability, and on-board USB (limited to 48k, alas), TosLink, SPDIF, and AES/EBU digital inputs (with resolution up to 196/24 on AES/EBU), as well as an optional analog-to-digital conversion board (for an extra $1000) that allows you to go directly from your phonostage/preamp into this all-digital loudspeaker, you have a veritable plug-and-play transducer of exceptional versatility and sophistication, and unique sonic qualities (104dB sensitivity, horn-loaded midrange and tweeter, tiny ultra-low-mass mid and treble drivers that have virtually no inertia and hence extraordinary resolution and transient response). When you consider that you are getting all this technology and sonic potential in such a small, attractive package, and when you add to this the fact that you only need add a digital front end and one USB (or TosLink, SPDIF, or AES/EBU) cable—or no cable at all if you source wirelessly from an iPhone, iPod, iPad, or computer via Apple’s AirPort Express—to own an entire high-end-audio system, you come up with something that is pretty damn special, something that seems well worth $17k, provided, of course, that it lives up to its sonic promise. What did the Zero 1 sound like? Well…like a mini-Avantgarde Trio. No, it didn’t have all the lifelike scope and scale, wall-to-wall-to-wall soundstaging, and incredible dynamic range of the Trio/Basshorn system, but it had enough of all these things to astonish me. What shocked me about the Zero 1s (and later even more so with the Trio/Basshorn system) was the absence of these negatives. The lack of coherence, the thumping discontinuous bass, the slightly constricted soundstage (because of the directionality and material resonances of the horns) …these things just weren’t there—or certainly not there to the extent I expected. Instead, what I heard was an extremely coherent (no marked driver-to-driver discontinuities), extremely neutral (no gross horn coloration I could detect at all), extremely open and unfettered presentation. 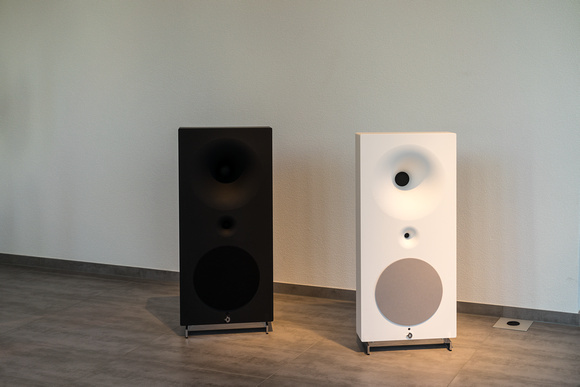 The Zero 1s, for all the world, sounded more like well-behaved two-way mini-monitors than three-way horn-loaded floorstanders. By this I mean they had the disappearing act and the vast soundfield of two-ways, with superb “outside-the-box” imaging and extension. Unlike two-ways, however, they had genuinely horn-like dynamic range and speed of attack, excellent bass extension, and some of the lifelike scale that made their much big brothers, the Trio/Basshorns, so damn impressive. Speaking of which, I also got the chance to listen to The Big Boys with both my analog and digital sources, and, well, if there is another kind of speaker capable of approximating the lifelike size, scale, and sheer acoustical power of a symphony orchestra going all out the way this one did, I haven’t heard it. On large-scale music the Trio/Basshorns were simply incredible. Like the Zero 1s, they no longer sounded like a collection of individual drivers. Instead, they were completely “of a piece.” And that bass! 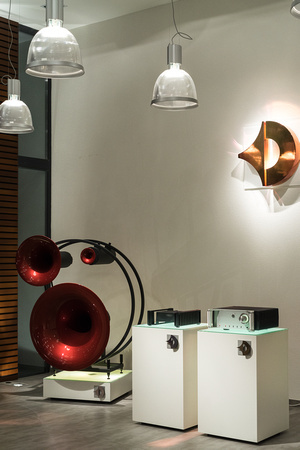 When the Trios are mated (as they were in Avantgarde’s listening room) to six centrally located, powered (by six 600W ADRIC amplifiers), expo-spherically horn-loaded Basshorns (with a collective mouth area of 54 square-feet), the entire system can reproduce true horn-loaded bass as low as 27Hz—and that, folks, is something you really have to hear to believe. After my stellar listening experiences at Avantgarde, I wondered whether my trip to Raidho in Denmark might prove anticlimactic. I shouldn’t have worried. Raidho’s Michael Borresen is a supremely ingenious fellow, and when it comes to loudspeakers he doesn’t fool around. Nor does he rest on his laurels. 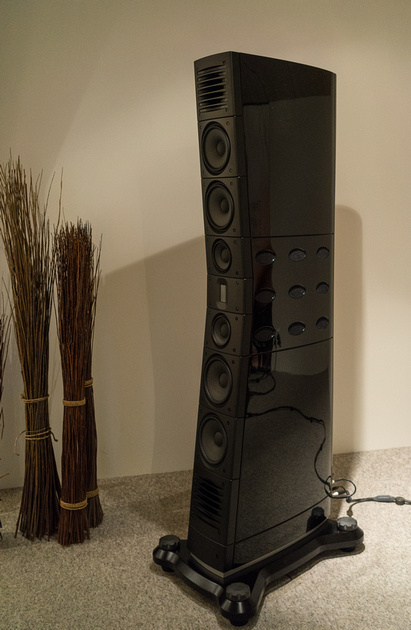 The Raidho C-4.1, my beloved current reference, is in most ways the most lifelike loudspeaker I’ve had in my home. It may not challenge something like a Magico Q5 when it comes to the measurement bench, but we don’t listen on paper, do we? The sheer tonal beauty, transient speed, dramatic power, and goosebump-raising realism that the C-4.1 consistently elicits from the best recordings—no matter what the music—is both addictive and incredibly endearing. That said, the C-4.1s are (as I noted in my review) not perfect. By design they are sucked out in the presence and brilliance range, and their bass, if the speakers are not very carefully accommodated by placement and room treatment, can be overblown. Mr. Borresen is not unaware of these problems and has sought to address them (and others) in his new flagship, the ribbon/cone D-5, which (though identical in looks to the C-4.1) incorporates all sorts of changes, large and small. The most obvious difference, of course, is the cone drivers, which no longer use ceramic diaphragms but diamond ones, both in the midrange and the bass. The story behind Raidho’s diamond-cone drivers begins with the man pictured above: Bjarke Holl Christensen, MSc, PhD Physics, and one of the chief physicists at the Tribology Centre of the Danish Technological Institute in Aarhus, Denmark. The Tribology Centre is a unique facility in that it is dedicated to finding practical commercial applications for the advanced physics developed at the Institute and through the Centre's own researches. 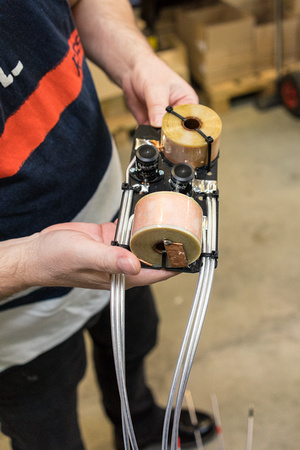 No high-end audio company that I’m aware of can afford its own particle accelerator or vapor-deposition laboratory, but the Tribology Centre can, and it is the Tribology Centre’s mission to make these tools (and the science behind them) available to small Danish businesses—like Raidho Acoustics. It is the Tribology Centre that gives Borresen the means to create his diamond-cone drivers (for a sizable fee, of course). Why diamond cones, you ask? Especially since Raidho already makes such excellent ceramic cones (using a chemical process developed by the Israeli military). The answer is that diamond is 50 times harder and stiffer than ceramic, and with that difference in physical properties comes a difference in resonant behavior. It is the resonance difference that is key. The reason that the Raidho C 4.1 sounds slightly sucked out in the presence and brilliance range is because a trough has been deliberately engineered into this region. Almost all loudspeakers have a trough here (the so-called Gundry dip) simply because it sounds better, but the Raidho C 4.1’s is considerably deeper than most in order to keep the break-up modes (and the different dispersion pattern) of its ceramic-cone drivers from roughening up the sound of its superb quasi-ribbon tweeter throughout the crossover range. Since the break-up modes of diamond-cone drivers occur at a much higher frequency (above 20kHz) than those of ceramic-cone drivers—and are considerably lower in magnitude—they allow Borresen to engineer less of a dip into the presence and brilliance range, as is there is less distortion to disguise. But diamond cones are only the most obvious change in the new D-5s. In the picture above you see Michael holding a D-5 crossover in his hand. Though you may not be able to pick them out, on that board are two new capacitors designed by Borresen and fabricated by Raidho. Though the Mundorf capacitors that Michael uses in the C-4.1 are excellent, Borresen felt they weren’t good enough for his new flagship—so...he made his own. (The guy is an incorrigible perfectionist—and brilliant enough to engineer just about anything that comes to mind.) The caps add to the lower distortion through the D-5’s crossover range. And so do the D-5s new bass ports. A peak at port resonance was perhaps the most obvious problem with the C-4.1s. Through the use of a pressure-variable subchamber Borresen has developed a way of substantially reducing that peak—and at the same adding some of the speed of a sealed system to the wallop of a ported one. So what does the D-5 sound like? At the risk of starting a ruckus I’m tempted to say: “The best full-range dynamic loudspeaker I’ve heard.” Only I can’t really say that with certainty until I’ve had it in my own room and given it a much longer listen. However, I can say this much with certainty: The D-5’s going to make the charmed circle, right alongside the very best from Wilson, Focal, Rockport, Avantgarde, Magico, MBL, etc. This is a sensational loudspeaker with all the beauty, speed, power, and jaw-dropping realism of its great predecessor and seemingly fewer of the C-4.1’s foibles. Almost as impressive in its own way was Raidho’s least expensive speaker, the tiny $7k X-1 stand-mounted two-way, which I also auditioned in Pandrup. When combined with Ansuz cables, vibration control, and power products (all designed by Borresen), the X-1 generated a wrap-around soundstage the likes of which I've only heard before from MBL's Radialstrahler omnis. 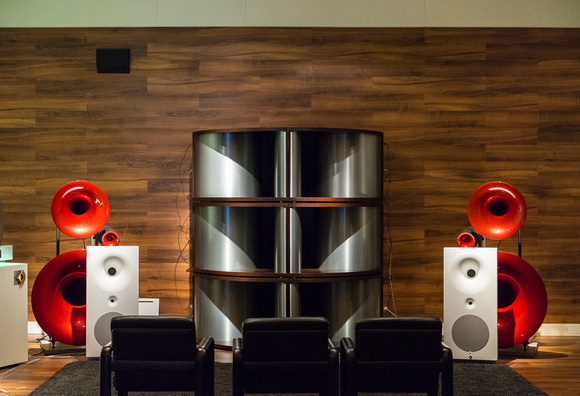 The speaker's disappearing act within this truly vast and enveloping soundfield was ear-boggling! Plus it has a warm, rich, full balance similar to that of Raidho's widely celebrated C-1.1 two-way (which is considerably larger). Simply put, another great transducer from Raidho. Just as a side note the X-1 uses a cutout in its bolt-on stand as part of its "port." A mirror-image cutout in the bottom of the speaker and a set of foam dampers that are placed in the stand's slot before tightening the speaker down completes the reflex system. This stand/speaker port is a first in my experience. It certainly works well, as the upper bass is so rich, powerful, and well-defined that the X-1s sound as if they are going much lower than they actually do. Returning to Ansuz, I also got the chance to hear the products of this new Borresen/Christensen company with several Raidho speakers. Called an “accessory” company, Ansuz fabricates Borresen-designed decouplers (called DARKZ), power cords and power conditioners (called MAINZ), speaker cables (called SPEAKZ), and interconnects (called SIGNALZ) in four progressively more expensive forms: POM, aluminum, ceramic, and diamond. In the case of the various wires, the signal conductors remain the same—very low inductance, low capacitance cables with superior grounding. (The number of wires increases as you go up the line but the configuration of those wires remains the same.) It is the connectors at the ends of each level of cable that are the main difference, and the progressive use of Ansuz noise-cancelation technology. Although I'm not fond of cable-swaps, I have to admit that I've never heard anything like the Ansuz before. It's not that these cables, interconnects, cords, and conditioners are higher in resolution and transient speed than other high-end wires and tweaks. Nor are they more beautiful and realistic sounding than the best of the competition. The difference they make—and I heard this difference repeated with every speaker in the Raidho line, from the X-1 through the D 5s—is, nevertheless, unmistakable and dramatic. To put this plainly, the Ansuz produce the most enveloping, three-dimensional soundstage I've ever heard, short of an omnidirectional speaker. Listening to speakers wired with Ansuz is a bit like listening to earphones in that the soundstage doesn't just get wider and deeper from the plane of the speakers to the backwall; with Ansuz the soundstage seemingly wraps around your head, so that instruments are staged from the plane of your ears all the way to the rearmost boundaries of the listening room. 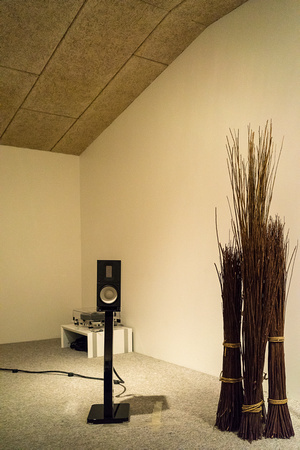 As a result, the speakers not only disappear, so does the room. Whether this startling effect is "correct" or not (i.e., an accurate reflection of microphone and instrumental placements or the product of some kind of consistent and sonically attractive phase shift) I don't know yet. What I do know is that Ansuz products generate the most three-dimensional soundfield I've ever heard from “mere” wires, isolators, conditioners, and stands. For many, many more photos and comments on my visit to Raidho’s showroom, factory, the Tribology Center, and the Ansuz offices, go to: http://jlvalin.zenfolio.com/p730237376.